A new video demonstrates the flexibility offered by Unibap’s Intelligent Automation solutions for Assembly, including jigless Zero programming (100 % programming free operation), autonomous object identification, real-time path planning, quality and dimension control, grasping, and information transfer to co-working robots to perform additional tasks in the production flow. Unibap will attend the 32nd Annual Small Satellite Conference in Logan, Utah during Aug 4-9 2018. We will exhibit our Deep Delphi iX5 AI Space Server Solution together with our U.S. distributor Troxel Aerospace Industries Inc. at the MOOG booth 63 and 64. Please contact our ceo at ceo@unibap.com to arrange a personal meeting. Together with MIBA Industriteknik, Unibap demonstrated industrial automated quality control and robotic pickup at the ELMIA Automation Exhibition 15-18 May. Many thanks to all who visited us, and also to MIBA for a great cooperation! Unibap will attend the ESA/CNES Small Satellite Systems & Services (4S) Symposium, Sorento, Italy, May 28 – June 1, 2018. Our CEO, Dr. Fredrik Bruhn will present a paper on A.I. computing in space on Friday 1st in session New Technology 3. Take the chance of seeing the DD-iX5 platform and discuss how intelligent processing can enhance your business. Safe travels. Unibap will attend the Space Tech Expo 2018, Pasadena, May 22-24, 2018. Our CEO, will attend. Take the chance of seing the DD-iX5 platform and discuss how intelligent processing can enhance your business. Safe travels. 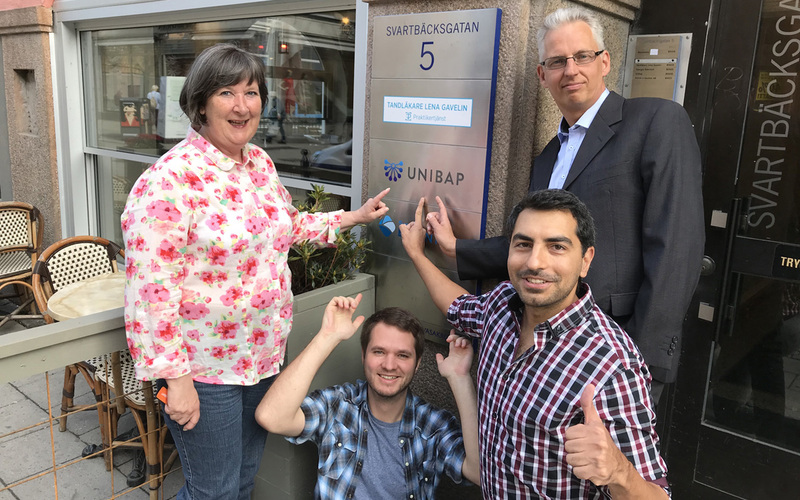 We are happy to welcome four new members to the Unibap team – Kerstin, Dana, Robert and Sebastian. On April 12, Unibap’s CEO Fredrik Bruhn participated in the Swedish online news program “Ekonomistudion” (Dagens Industrier). He presented Unibap’s business areas with a particular focus on products and services for the space industry. Brainpool is an association that supports young people with special talent in their social and intellectual development. Through a new agreement, Unibap becomes one of Brainpool’s main partners. This means long-term cooperation, both financially and through Unibap’s participation in Brainpool’s activities.